Hot off the presses, my book American Terroir is now out in paperback. 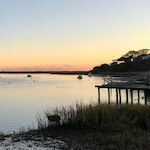 Oyster lovers can savor my chapter on “That Totten Smell,” a journey from Rhode Island to the backwaters of Puget Sound in search of the essence of my favorite oyster. General terroiristes can explore the worlds of salmon, coffee, chocolate, cheese, wine, apples, honey and more and learn why place is the key to the greatest examples of each. You can also buy the ebook.